Magnetic and plasma signatures from the Cassini Plasma Spectrometer (CAPS) and magnetometer (MAG) instruments on board the Cassini spacecraft orbiting Saturn motivated my magnetospheric simulations of Saturn. CAPS observed hot, tenuous plasma interchanging with cool, denser plasma. Cassini measurements such as these prompt questions about the extent to which internal or solar wind conditions control these plasma processes. Saturn is dominated by a source of cold heavy ions: Enceladus, an icy moon deeply embedded in Saturn's inner magnetosphere. A recently discovered plume of ice and water vapor emanates from Enceladus' south pole; this plume creates a torus of particles centered near the moon's orbit. It is believed that the cold Enceladus plasma flows out from Saturn while other sources feed the inner magnetosphere via frequent injections of warm energetic plasma sheet plasma. 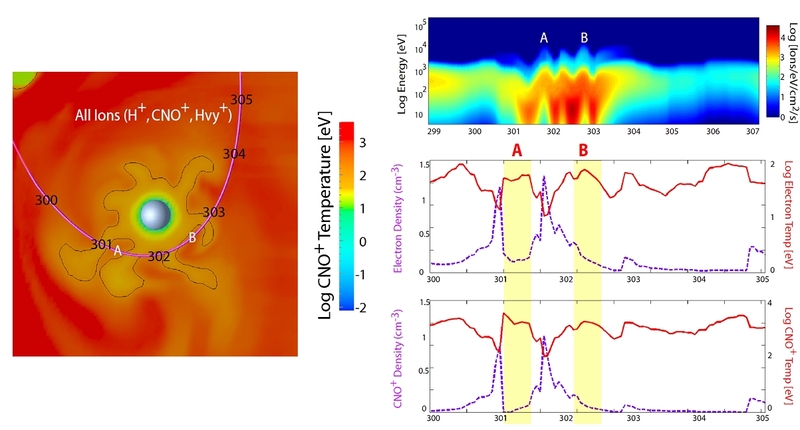 The cold outwelling plasma interspersed with hot injections, dubbed ‘the centrifugal interchange cycle,’ is similar to a Rayleigh-Taylor instability. I use my multi-fluid model to probe the global geometry of these interchanging fingers of plasma and determine the extent to which their development is influenced by external factors such as the IMF and internal factors such as the concentration of ions in the Enceladus torus. Simulations by Kidder et al. demonstrate that interchange finger development can be enhanced by certain internal and external conditions. Increased convection when the IMF is anti-parallel to Saturn's magnetic field allows for growth in the inner magnetospheric plasma that is centrifugally interchanging. In addition, increased densities in the Enceladus ion torus produce an enhancement in plasma interchange.